E-1 ($12.00) 17 x 24 inches. 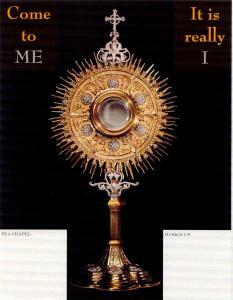 Gold Monstrance with black background, gold and gray print “Come to Me It Is Really I ... I Wait for You in This Sacrament of Love.” Perpetual Eucharistic Adoration information is written all around the monstrance in white print (not shown in this picture), the effect is striking.